Recently, many automakers have taken the fashion to call their models new, replacing in them literally one light bulb in optics. Ford Escape, played on the verge of a fall and also positioned its model as new. But in reality, the Ford Escape 2017 is a deep restyling of the previous car, but definitely not a new model in the classic sense. If you do not like the word restyling, you can use facelift, and you need to pay tribute to the company, in this regard, they really worked. Compared to the 2014 model, the refreshed car has changed quite dramatically, having received more aggressive features. It has become sharper or even more audacious in visual perception. What stands out is a completely new performance grille, updated optics and hood, the absence of a pronounced descending roof line. In total, the novelty received four configuration levels: Trend, Trend +, Titanium and Titanium + for Europe, but in America, the configuration has the name S, SE and Titanium. In the engine range, there was a place for a 2.5-liter, 150-horsepower atmospheric engine on gasoline, as well as two 1.5-liter Eco-Boost two-turbocharged petrol engines, 150 and 182 hp. In Europe, TDCi diesel engines are also available for the Escape, including: a 1.5-liter engine producing 120 hp. and two 2.0-liter engines, delivering 150 and 180 hp. All the engines work in tandem with a robotic 6-speed automatic box PowerShift. Just want to note the system of opening the trunk with the help of a swing of the leg. This system works perfectly in this car. No need to dance or wave your legs like a football player to watch in the best club in the world. One swipe with one foot is enough and the trunk opens immediately. 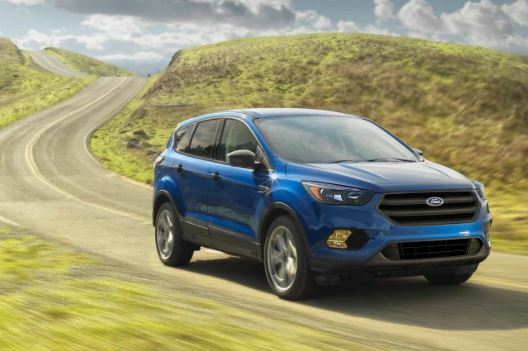 Note that this system in the Ford Escape appeared first in the class of similar crossovers. You can close the trunk either from the button located on the fifth door or on the key-key fob, or by the key itself. If you have already started talking about the trunk, then we say that it does not possess particularly gigantic volumes of usable space – 456 liters with the back of the back sofa raised, which increases to 1600 liters if you lower the back of the rear seats. Ford Escape can not be called a classic car from America. Starting with Escape, the engineers decided to resort to some cosmic motives. In the novelty did not happen anything revolutionary inside. All the same futuristic central panel. In the top model, you will find an 8-inch touchscreen, which can be controlled both tactilely and using buttons. The system also recognizes voice commands, is friendly with devices on Android and iOS. The instrument panel initially may seem overly bright. There are many colors in it: yellow, red, blue, white. All of them are saturated, you can even say – poisonous. The same story is repeated on the center console, where the control buttons are highlighted in different colors and quite intensively. But as far as readability is concerned, there are no complaints here: everything reads clearly, all the letters, numbers and arrows are clearly visible. There is more than enough space for passengers at the back. Even with the front seats pushed as far as possible, a man of average height will not rub his knees against the back, and there is enough space above his head for a half of his palm. In addition, the backs of the rear seats can be folded back and travel freely in a dilapidated position. Any motor in this car can surprise with its agility. This is especially felt when starting from a place or at low speeds – the rise is really impressive. And this is without the use of Sport mode. The crossover can be safely entered into the list of the best representatives in the world by setting the suspension in conjunction with the steering: juicy, poured, understandable steering wheel and a very smooth, comfortable and soft suspension, which is devoid of even a hint of valkost.The machine has received increased noise insulation. This is especially true of passengers in the front. Behind the effect of sound insulation is not so pronounced, but in front of the level of acoustic comfort has grown significantly. But you have to admit honestly that the insulation itself is not the strongest side of the model. In this class there are cars that have much better characteristics in this regard, but they are more expensive than Escape. The driver’s space is made in a certain cockpit where you feel yourself in a sporting atmosphere. At the same time, the driver does not press anywhere, everything is ergonomic and comfortable. The same bottom cushion has become a bit more when compared with the same Explorer, which added more comfort to the driver. The car received a decent visibility. The side mirrors, though not large, are configured so that everything is perfectly visible in them. In addition, a reasonable system is able to automatically transfer almost one hundred percent traction to the front or rear axle, depending on the traffic situation. To this adds 20 cm of ground clearance, which allows not worrying about snow tracks and other road troubles, if you do not intend to conquer virgin or fallow lands. For country conditions or in case of conquest of snowdrifts in the parking lot, clearance will be more than enough. Ford Escape definitely like American motorists. In USA, every second car sold is a crossover. Due to the availability of this model from the USA, the thought of buying this vehicle seems to be a very reasonable move. Our company is ready to commit to the selection, purchase, delivery and documentation of cars from America for you.